The symposium addresses important issues in ultrasound probe reprocessing through a focus on a set of practical tools developed by a group of concerned IPs. An IP toolkit was developed in response to the growing need for a systematic approach to ultrasound infection prevention management. The on-demand videos provide immense benefit to those already actively surveying ultrasound probe reprocessing, probe use in your facilities or needing guidance on where to start. The outcome is to achieve better infection prevention compliance to ensure the best possible outcomes for patients in our care. 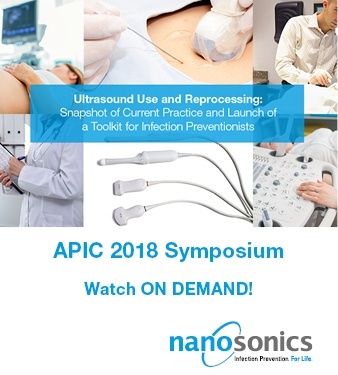 To download the video for ‘2018 APIC Symposium – Challenges in Ultrasound Infection Prevention’, please provide us with your contact information.